Hello, my name is Papang Jakfar. 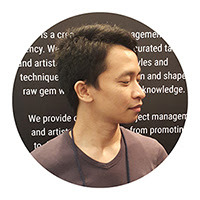 I am a visual artist from Malang, Indonesia. Disney, Batik and Wayang are my 3 favorite things, thus influence my art style which is cartoony, detail, and decorative. Majoring Visual Communication Design at State University of Malang sharpening my sense of design. My freelance works began in 2007, in the field of character design for games and animation, publishing illustration, and comic. My goal in creating art is simple: to makes other smile when seeing my arts.